It has been revealed that benefit sanctions (that is, the removal of state financial support) against people with mental health issues has risen 700% under the Conservative government. 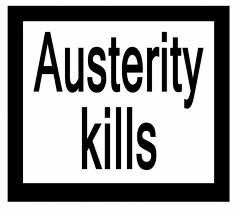 This startling figure prompts us to take a hard look at how austerity has contributed to the deaths of British people. From the moment the Conservative and Liberal Democrat coalition came into power in 2010, the welfare state and those dependent upon it came under threat. 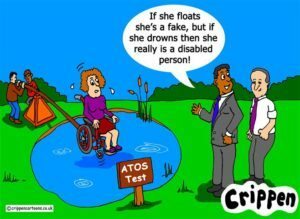 The coalition government demanded that every single person claiming social security payments for sickness or disability undergo a work capability test with Atos, to determine whether they could really be working. The clear implication being – many of these people are just trying it on. In fact, ministers not only implied it, but propagandised about it until many people believed it was benefit fraud, and not the Bank Bailout which caused our sky high debt. In 2013, the UK Statistics Authority publicly condemned the Department for Work and Pensions’ (DWP) misleading use of figures, accusing them of making claims about the results of their policies that were ‘unsupported by official statistics’. In short, they just made this stuff up. The Guardian also exposed repeated cases of former DWP Secretary of State Iain Duncan Smith, and former Tory party Chairman Grant Shapps, misrepresenting data on benefit claims and the true impact of their policies. The made-up figures made it into press releases, which resulted in bogus articles in the Telegraph, The Mail, The Sun, the Express, together with the ITV and BBC News (along with many local news outlets)– all of which parroted disinformation without bothering to verify it. As a result, the lies repeated often enough became the truth and a climate of suspicion formed around those who find themselves reliant on the welfare system. 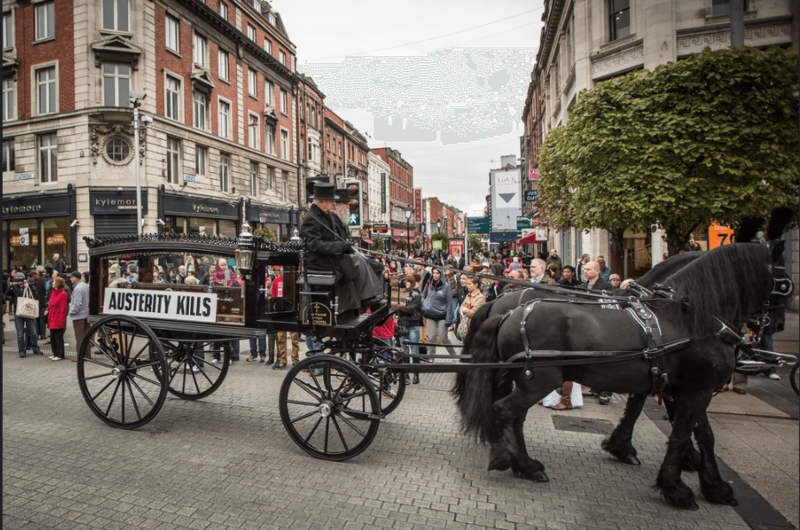 This public stigmatisation, coupled with the threats and real cuts to vital financial support has resulted in sickness, suicide and death for those affected. 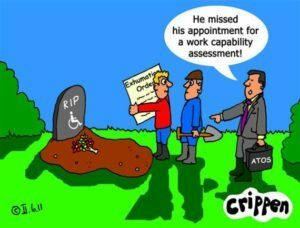 The government’s own statistics show that between 2010 and 2011 10,600 sick and disabled people died within six weeks of their ‘fit to work’ assessment by Atos and the DWP. This is 204 people a week, or 29 people a day, dying of the illnesses and conditions that the government has asked them to prove. These people spent their final weeks alive being harassed by the Job Centre, late payment notices and threats of eviction as their social safety net was ripped away. This figure stands at 1,300 for the 11 month period January 2011 to November 2011. From this we can extrapolate a reasonable estimate for the number of people to have died after being told that they are fit enough to prepare to return to the workplace. If we increase the figure by one 11th to extend it to cover a full year, we get 1,418 and extend it again by 15% to reflect the fact that the number of WCA assessments undertaken in 2012 has been significantly higher than those conducted in 2011, we get an estimated figure of 1,630 people to have died in 2012 within six weeks of having been told that they must start preparing to go back to work. As this horrific figure is almost too large to take in, here are some names among that number. I sat there and listened to my wife drown in her own bodily fluids. It took half an hour for her to die; a woman who is apparently fit for work. The decision to place sick and disabled people under this level of wanton pain and disruption was as callous as it was ineffective. 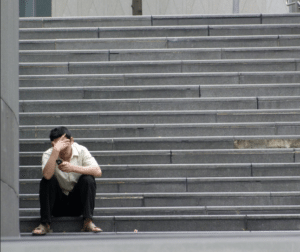 A recent report, by researchers at Oxford and Liverpool universities, has directly linked austerity policies to mental health crises and suicide. Although the explicit aim of welfare reform in the UK is to reduce ‘dependency’, it is likely that targeting the people living in the most vulnerable conditions with policies that are harmful to health, will further marginalise already excluded groups, reducing, rather than increasing, their independence. The Canary was criticised by some for a previous decision to break with Samaritans’ guidelines in order to report these findings and the individual suicide of a junior doctor. But this criticism overlooked something very important: context. However, what must be acknowledged is that Jeremy Hunt is providing the kind of stresses on junior doctors which can foster and exacerbate mental health crisis. Stresses like long working hours, lack of sleep, the financial concerns associated with reduced pay and conditions, and the creation of a hostile working environment. Secondly, the point was validated by findings of the study by Oxford University and Liverpool University. Thirdly, it was a decision we weighed with real care. The Samaritans is an esteemed organisation, and they wrote those guidelines with good reason. We also believed then, and we believe now, that the issue of government policies contributing to mental health crises and suicides has to be reported. It is also necessary that the plights of individuals should be made real, and their lives not reduced to a statistic. 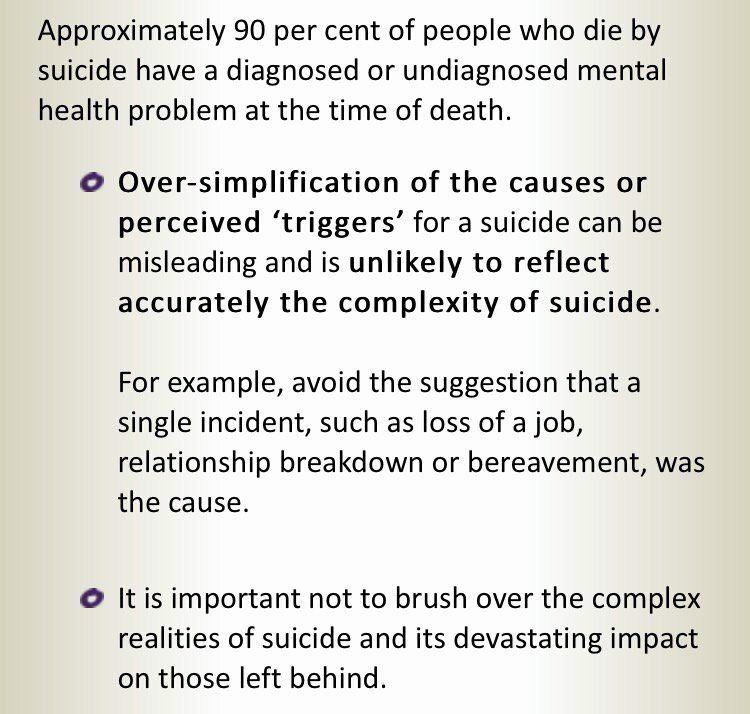 Yet when it comes to UK, ooh suicide is complex & you can't put blame of the govt. Well yes it is and yes you can you gutless hacks. We didn’t make these suicides political – they are political. Austerity, the work capability assessments, the terminal decline of working conditions and morale of NHS staff – these are political choices, with real world consequences. To fail to shine a light on that level of suffering, and demand change, is an abdication of responsibility in our view. We are now at the stage where for the last two years, around a million British people have been relying on Food Banks to eat. We are a country where homeless men like Daniel Gauntlett are freezing to death on porches, and others like Ranjit Singh are being crushed to death by refuse collection vehicles after sheltering from the cold in bins. Our country has become a place where 590 people killed themselves in the last few years, in part, due to stresses placed on them by their own government; a place where nearly three-quarters of a million people require anti-depressants to help them cope with the same stresses. Forget writing about it, we should be shouting it from the rooftops. Thankfully many have. Campaign groups like Disabled People Against Cuts, and The Black Triangle Campaign have been relentless in raising these issues. They have mobilised against them, and for a fairer and more supportive system. We stand with them. By their side. We will support however we are asked and whenever we are invited. We encourage our readers to do the same. Find out about the campaigns of Disabled People Against Cuts (DPAC) and how to support them by clicking here. Find out about the work of The Black Triangle Campaign and how to support them by clicking here.